Hiring? Toptal handpicks top project management consultants to suit your needs. How Do You Measure Project Manager Performance? It is notoriously difficult to evaluate project managers’ performance because a lot of what they do is very qualitative and hard to measure. People tend to notice when there is a lack of project management—communication channels are weak, people are not sure what others are working on, unexpected problems create delays, etc. However, when a project manager is present and things are going smoothly, many of their colleagues would not be able to clearly pin down what it is they exactly do. Another difficulty in assessing performance is that the profession of project management is in flux. With the advent of Agile, other roles like product owner and scrum master have been taking over some responsibilities that were traditionally carried out by project managers. 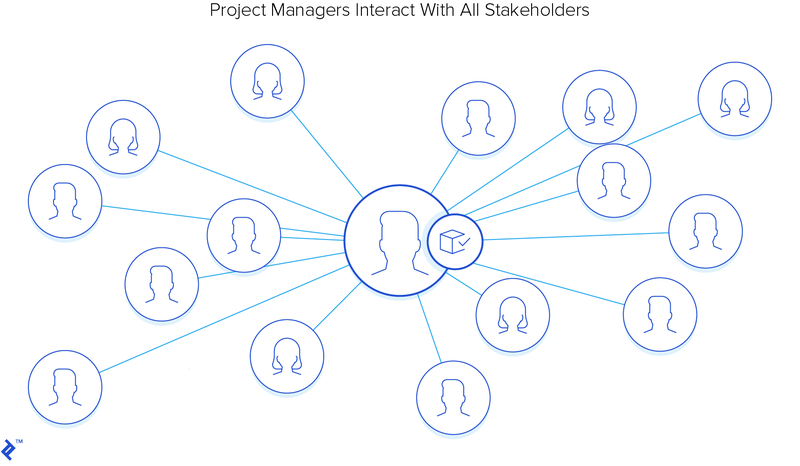 Additionally, in many companies and teams, the roles of a project manager and product manager are intertwined. In some cases, one of those takes on the responsibilities of both. It is helpful to think about the project manager as the COO of a product, who is responsible for how and when things are built, while the product manager is the CEO and is responsible for what and why gets built. The project manager owns the process, while the product manager owns the content. In this sense, the project manager should be evaluated for their efficiency in delivering a project. Understanding these KPIs will be essential in gauging the success of project managers that you bring into your company or team as well as providing a basis to provide feedback. The project manager owns responsibility for managing the overall project plan. This includes coordinating the timely preparation of all of the deliverables and working to ensure that the budget is adequate for the plan. Project managers in an Agile development team are going to be managing the communications of the teams to support the on-time goals of getting a product to market. While it’s understood that the Agile method is designed to be flexible in order to create the right solution for customers, unless trade-offs are properly managed, this can lead to scope creep, and then to delays. In this case, the scrum master, or an equivalent Agile coach, is responsible for the internal efficiency of the development team and timely completion of sprints. Delays can also appear from many points in the product release cycle, not just from the engineering and test organizations. It might be an executive decision to delay for tactical or strategic reasons. It could be that legal or the deal desk are not ready to handle bids and orders. It might be that there is an event that marketing would like to coordinate the release with. A strong project manager will be constantly reviewing the plan against the actual progress to catch any inconsistencies. These tiers are especially useful when evaluating the performance of multiple projects. The tiers can be adjusted based on the circumstances of the company. For example, if projects are bound by a contractual agreement with the client and late delivery carries monetary penalties, then the evaluations for being late should be more severe. The same tiers can be used not just for the whole project timeframe, but also for shorter periods like milestones. Agile projects can also be fixed time, in which case the metrics the previous section still hold. However, many companies now operate without a fixed schedule, prioritizing the delivery of real customer value over a strict development timetable. The project manager should be evaluated for setting release expectations and managing the lines of communications to all of the stakeholders to reduce discontent and protect the brand with the customer. Exceeded expectations: Third-party delays were virtually non-existent. Good: Most third-party dependencies were managed, delays were minimal. Acceptable: Third-party delays sometimes affected the delivery of the team. Poor: Third-party delays constantly and heavily affected the delivery of the team. Where margins are a critical corporate goal, managing the operational costs of goods (not including sales and marketing) form a critical KPI for project managers. In the case of budget challenges, a strong project manager will look for additional opportunities to reduce costs in other areas. If there is no opportunity to recoup, then they should manage the escalation of the situation and, working with the product manager, seek approval for additional budget. Exceeded expectations: Project was completed with savings of 10% or more, budget milestones were planned and achieved. Good: Project was completed with 0-10% savings, budget milestones were planned and achieved. Acceptable: Project budget was exceeded by less than 10%, budget milestones were planned but not achieved. Poor: Project budget was exceeded by more than 10%, budget milestones were not achieved. Save time by eliminating unnecessary dependencies. Save money by automating processes and eliminating manual effort. Increase customer satisfaction by simplifying interactions and improving the customer experience. Exceeded expectations: Process improvements were constantly undertaken and provided valuable efficiency gains most of the time. Good: Process improvements were undertaken often and provided valuable efficiency gains a lot of the time. Acceptable: Process improvements were undertaken often but provided small efficiency gains. Poor: Barely any process improvements were undertaken. The project manager is the key interface with all of the organizations in bringing a product to market. It is critical that those relationships reflect the project manager’s goal of delivering an excellent solution to fulfill their needs in the time that was announced. For project managers, it translates to three questions that will help to identify if that partner organization is able to meet the requirements of the project. Can you do this with the talent you have? Talking with employees from other departments can provide valuable insight into the quality of relationships that the project manager has established. A more rigorous approach would be to have a 360-degree review on interpersonal and communication skills. The results can then be used to evaluate the project manager performance. Exceeded expectations: Engaged with other departments proactively and other departments engaged proactively with the project manager or their team. Good: Engaged with other departments proactively. Acceptable: Engaged with other departments reactively. Poor: Rarely engaged with other departments. Every project inevitably includes risks, which can be ignored or managed. While a poor project manager can be easily assessed after an uncontrolled risk has caused damage, it is harder to assess a good project manager because the risks are controlled and there is no damage to calculate and quantify the negative impact. A way to assess a project manager is to probe their preparedness and the impact of their decisions. An effective project manager will craft a risk mitigation plan to decide which risks warrant attention and action. Exceeded expectations: Maintained a risk mitigation plan with clear actions and was able to clearly communicate their decisions. Good: Maintained a risk mitigation plan but the responses to risks were not well thought-through or realistic. Acceptable: Did not have a risk mitigation plan but had given some thought to it and was able to communicate at least some risks. Poor: Did not think about risks and managed them ad-hoc when they arose. A strong project manager will be constantly validating decisions against the customer’s perspective blended with the profitability goals of the business. They will represent the customer’s view in product decisions and explore how a customer might feel if one action is taken over a different action. In evaluating a project manager’s approach to their position, listen for the win-win attitude that balances customer goals with business goals. Where are we against the committed timeframes? Are we ready to answer questions from prospects? Can we take an order? Do all the services work as described? Is support ready to answer questions? Are we ready to onboard new customers? Exceeded expectations: Brought the customer perspective to all discussions and decisions and was able to balance it with business goals. Good: Brought the customer perspective to most discussions and decisions and was sometimes able to balance it with business goals. Acceptable: Brought the customer perspective to discussions and decisions more often than not but was not able to balance it with business goals. Poor: Rarely represented the customer and focused on business goals only. Project managers must function as the water in a water slide, keeping everything moving as expected. It’s equally important for project managers, as with other roles, to plan performance evaluation with an agreed upon set of performance metrics that can be reviewed at any point in time. These project manager performance metrics are useful both for the project manager themselves or for someone supervising them. The first review sessions should be done to establish a benchmark and find biggest gaps in the project manager’s work. Areas of improvement should be agreed upon for the next review in 3, 6, or 12 months when the project manager performance metrics will be revisited. This article went through a comprehensive list of potential KPIs that a project manager and their supervisor should consider. Not every team will prioritize these KPIs equally; however, it’s beneficial for all parties to be aware of these KPIs and to choose the most appropriate ones to continuously gauge performance. What are key performance indicators (KPIs) in project management? KPIs in project management would explore six key areas including on-time and on-budget delivery, process improvements, relationships and communications, risk management, and customer orientation. What are key performance indicator examples? Key performance indicators can include on-time delivery, resource availability, and customer escalations along with more subjective metrics associated with overall team performance, culture, and communication styles. How do you choose KPIs? In evaluating project manager performance, choose KPIs that explore an understanding of the progress and risks at any point in time. With a goal of on-time and on-budget delivery, a successful project manager will be on the lookout for ways to improve communications and processes. What is a KPI in Agile? With a goal of less replication and reduced time, one Agile KPI is sprint velocity. Velocity counts the number of units of work done in a certain interval. For example, if the team completed 10 stories during a 2-week sprint and each story was worth 3 story points, then the velocity is 30 story points per sprint.